This page gives information/services information for our Local GP Practice; What to do if you are Unwell; Wye Valley Trust & Hereford Hospital; Dental Services; Adult and Children Social Care; St Michael’s Hospice 24 hour helpline; Stress, Anxiety and Depression; Alzheimer’s and Dementia Services; Parkinson’s Society; Red Cross; Age UK ; Royal Voluntary Service (WRVS); The Cart Shed; Community Transport; Shopbmobility; – Just scroll down the page for information on each. The Mortimer Medical Practice in Croase Orchard is the local NHS GP practice for Kingsland. Details of services, clinics etc can be found on their website below. The practice welcomes feedback from patients. Suggestions can be made by leaving something in one of the suggestion boxes or by speaking to one of the staff. We can also be contacted via email at gene.clark@nhs.net . Every year Hereford Accident and Emergency Departments sees thousands of patients who could have been seen elsewhere. If you are not sure where to go contact the surgery or NHS Direct for advice. Life threatening or very serious conditions/injury? Go to Accident and Emergency or telephone 999. There are no dental services in Kingsland. the nearest are in Leominster and Weobley. There is a page on Herefordshire Council’s website to access Children’s and Adult Care Services and Information in the county. You can see it here. Are you living with a terminal illness, or caring for someone who is? The incredible support St Michael’s receives from the community means your local hospice is now providing more care to more people for longer periods of time. St Michael’s mission is to ensure that end-of-life care is available to everyone who needs it. This includes patients, their family and friends. We want to enable people to do the things they want to do and make their life easier and more comfortable. All care at St Michael’s is provided free of charge, and people can be referred by any health or social care professional involved in their care. We care for cancer and non-cancer patients, and because everyone’s illness is unique, we offer a range of different treatments. Our regular outpatient clinics and support groups can give people the confidence and advice to help them live well with their illness. For example, people with fatigue and breathlessness can benefit from courses offering practical advice. Our occupational and physiotherapists can help alleviate or control a range of symptoms, and with personalised exercise programmes and home adaptations, they can make a real improvement to independent living. Our person-centred approach means we also provide psychological and emotional support through our counselling service and social care team. Visiting the Hospice offers people a chance to socialise, make new friends and take part in activities that range from arts and craft sessions to informative talks. We understand this can be a difficult time, and that’s why we’re here for you 24 hours a day, 7 days a week. You can call 01432 852 080 any time of the day or night, 365 days a year. This number is a single point of access allowing you to speak confidentially to members of our clinical team who can provide advice and information on subjects like accessing services and controlling symptoms. 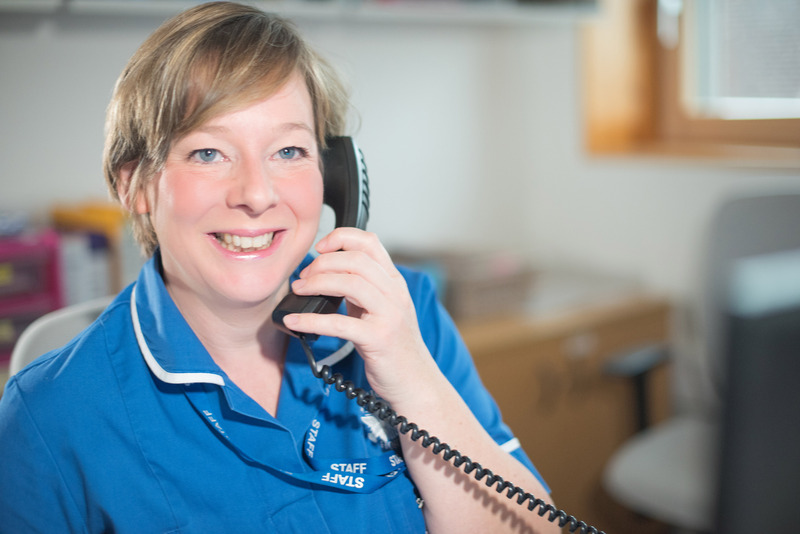 We can be contacted on 01432 347606 and there is more general information and how to book courses on the NHS website here. It’s a great opportunity for people to chat with others in a similar situation over a light lunch, and receive support and understanding. A different speaker each month gives us information and advice on different aspects of living with memory problems and related illnesses. Everyone affected by dementia is very welcome to come along. We ask for a small contribution towards refreshments. See link for Hereford and Leominster branch information or go to the National Site Home Page where lots of information and advice is given to fellow sufferers. Age UK offer a lot of advice and support for and to older people. Herefordshire services can be found on their website by clicking here. “As you may already know, to mark our 75th anniversary, WRVS have relaunched as Royal Voluntary Service. We’ve got big ambitions for the years ahead as we plan to reach more than two million older people. It’s more important than ever that everyone needs to know who we are, what we do and how we help improve the lives of older people in Britain. You can also find information on local Herefordshire services here. 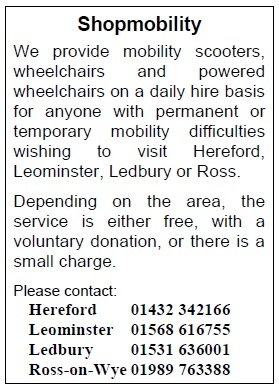 They also offer Community Transport if you need help getting out and about so check the link above. The Cart Shed is a Community Interest Company (a social enterprise) offering therapeutic activities for adults with mental health problems and young people at risk of exclusion from school. We use woodland, a farm and a spectacular walled garden as the venues for the rural skills therapy programmes we run. More information is available on our website www.thecartshed.co.uk ; please take a look. If you need to get to health appointments and don’t have your own transport please check out Transport page here for Community Transport available locally.